Clemson football has been cultivating a graveyard for decades and somehow I didn’t learn this until a few days ago. I saw a story about it on social media and just assumed it was either fake or something put together for comedic effect. Then, I went back and looked it up and it’s so very real. It seems on brand for Clemson but I had several questions. Why Ya’ll Building a Graveyard? So this story all starts with payback against Florida State. Since 1962, the Seminoles have been cultivating a “Sod Cemetery” in which they bring home a piece of grass from their opponents field but only for road games in which they were underdogs, or all road games at Florida, and later all ACC Championship Games or bowl games. I’m assuming Florida State no longer physically brings back sod anymore with so many field turf stadiums across the country. In 1988, the #10 Seminoles visited #3 Clemson and played a crazy game that featured Deion Sanders taking a punt back for a touchdown and looking like he’s playing on fast-forward, plus a crucial “puntrooskie” to set up the game-winning field goal for Florida State. The visitors then promptly brought some sod back to Tallahassee for their collection. A year later, Clemson scored revenge at Florida State and decided to bring back some grass from Doak Campbell Stadium to begin their own tradition. For the record, Florida State has 4 interments for Notre Dame from games in 1981, 1994, 1996, and 2011–the last 3 all from bowl games. 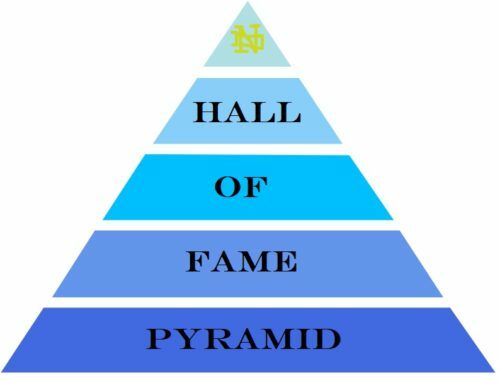 The Seminoles might have thought they had a slim chance to add one more this year but Brandon Wimbush & Co. said lol no go home ‘Noles. Clemson has been doing things differently than Florida State, though. For one, the Tigers reserve this for any win over a ranked team away from Death Valley. 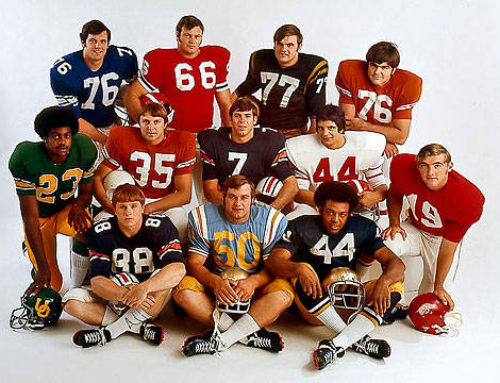 Secondly, they never made taking a piece of sod part of the tradition beyond that first time in 1989 at Florida State. Clemson has also been using upright headstones while Florida State has always used flat headstones. The amount of money needed to keep this tradition alive is both creepy and impressive. So how many headstones in total? As you can see in the video down below it appears Clemson packed all of their pre-1989 worthy games onto one slab of stone. 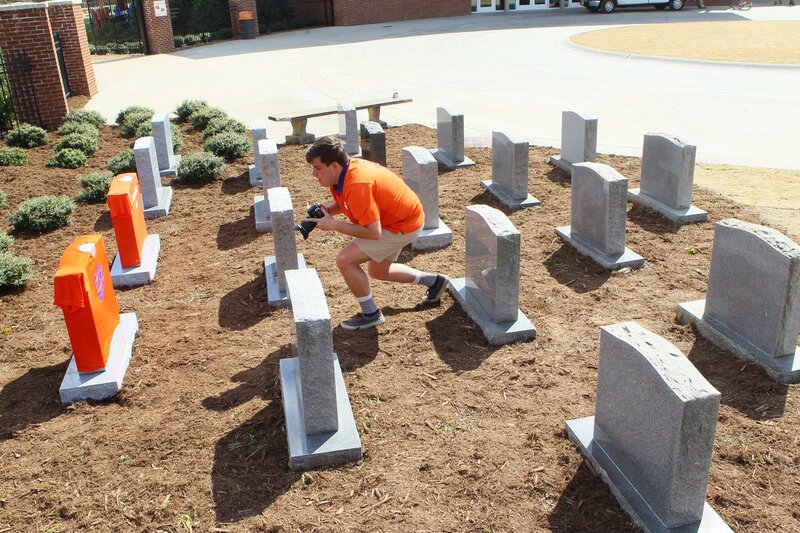 With all of their additional interments there should be a total of 30 headstones now in Clemson’s graveyard. 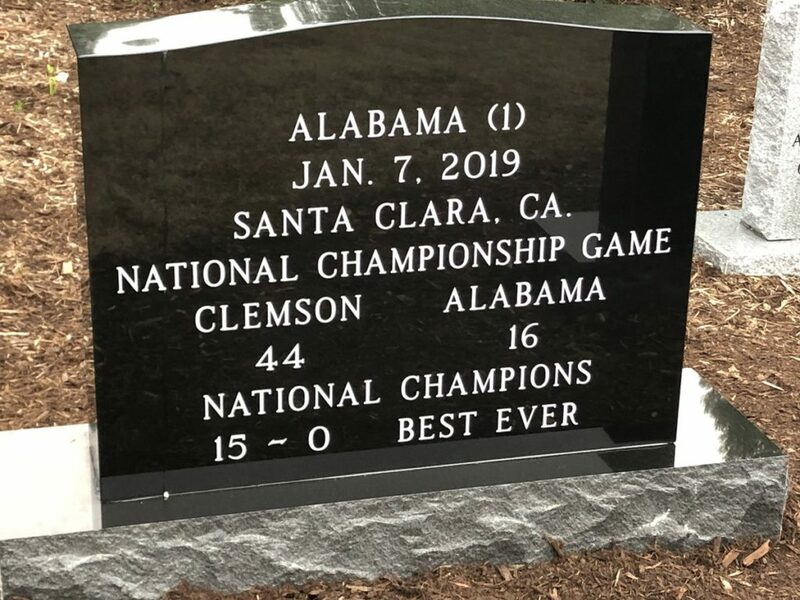 A full 20 of those have come during the Dabo Swinney era, including a new one for the win over Notre Dame in the semi-final, although all of the recent media coverage has surrounded the new Alabama headstone. The newest tombstone at Clemson. It’s important to note that Clemson uses ranked teams on the road at the time the game is played. Plus, both the AP and USA Today polls if necessary. For example, there are headstones for the 2012 Auburn and Oklahoma 2014 games even though neither team finished ranked at the end of their seasons. Not a huge deal but something noted for history. I want to say yes, although Clemson’s success under Swinney kind of makes it feel a little absurd these days. Also, if we’re being technical, Clemson isn’t building a graveyard since the headstones aren’t part of or connected to a Church. Florida State got it right with the cemetery designation. This got me thinking, what if Notre Dame did something similar? There are plenty of headstones on campus already though as the 22-acre Cedar Grove Cemetery is one of the more prominent areas of campus for visitors coming through the main entrance. Even if there are a lot of funeral procession ideas that could spring from the hordes of fans who attend Mass immediately following Notre Dame games I have a simpler, friendlier suggestion. 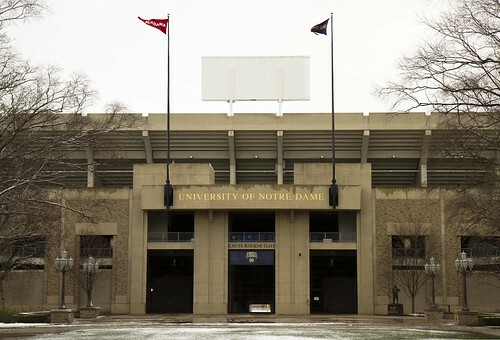 For decades, the northern Knute Rockne gate at the stadium has flown a Notre Dame flag and the flag of that week’s upcoming opponent. It’s a nice classy touch. What if the flag of each defeated opponent (for each season) remained on top of the stadium? A collection of flags flying overhead would be a cool memorial for pictures. What would be your idea? We have won so many great games over the years, picking a way to remember them in some fashion seems impossible. We would also have to flying too many flags over the stadium. I view it a bit like rushing the field or the court after a ‘big’ win. In football, we should expect to win. There is never a reason we should storm the field. This isn’t Troy beating LSU. As you say, Dabo’s success makes it seem out of place. We should be striving, and expecting, to be where it would be out of place. We should enjoy the game, but creating a permanent reminder seems tacky and somebody else’s tradition that we don’t need to steal. My bad, just realized I wasn’t clear enough. I meant flags just for that current season victories. So, 14 empty flag poles to start the year and see how many we fill up. Generally, if you have to ask, the answer is no. This is one of those cases. Picture, if you will, brick road. Each brick is engraved with one of the major victories. Larger bricks for things like championship-clinching wins or major bowl games. Not sure where it leads from, but likely should be something the players march over on their way to the stadium. I like the brick idea! Bricks could work, but then I would do the walkway for all sports. Just championship, Final 4 or bowl wins. The championship ones are bigger. Perhaps you start working your way around the inside of the stadium or the JACC or from the JACC to the stadium. Those bricks would look awesome surrounding the Knute Rockne Memorial Splash Pad at the bottom of the Dan Devine Slippery Slope from the Ara Parseghian Upper Deck Fun Zone! Opponent helmets on pikes. Why bother with all this timid, clean, g-rated crap? We win a game over a ranked or playoff team we take their helmet, impale it on a golden spike and line ND stadium with their effigy. This would be a very effective idea, particularly if we don’t bother to remove the helmets from the opponent’s head prior to spiking.